The frame "Analysis" shows the analysis results. Several computations can be carried out for a single task. Analysis according to EN 1997 - the last column in the table allows for specifying whether the load acting on a structure is considered as secondary one. This is explained in more detail in section "Load combinations". Providing the analysis is carried out according to "Design approach 1", it is necessary to enter the combination number in the right part of the window. 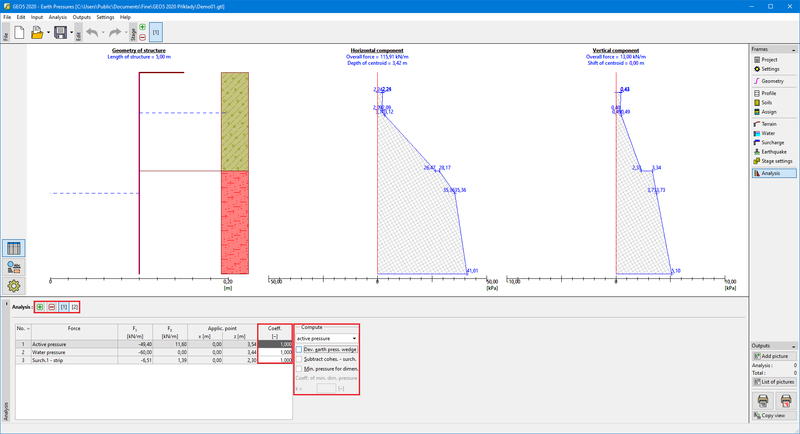 The "Analysis" frame displays the analysis results. The frame serves to select type of computed earth pressure (active pressure, pressure at rest, passive pressure). Two options "Create soil wedge" and "Minimum dimensioning pressure" are available when computing the active earth pressure. The analysis results are displayed on the desktop and are updated immediately for an arbitrary change in input data or setting. Visualization of results can be adjusted in the frame "Drawing Settings".